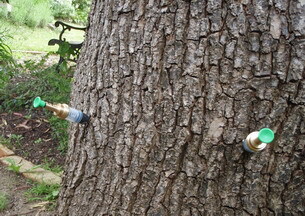 An insecticide is injected (via multiple small drill holes) directly into the trunk of the tree, the tree transports the chemical to the leaves where it kills the Elm Leaf Beetle and larvae. We use a narrow diameter, slow delivery injector when the tree is naturally transporting water; when in leaf or immediatly prior to leaf set. This timing reduces the damage to the tree associated with drilling. We don't drill in winter as there is almost no natural transpiration and the force needed deliver the chemical increases the tissue damage and potential for decay. The injection holes from previous treatments cannot be re-used as the tree shuts down the tissue around each drill hole; this is the trees natural defence mechanism to minimize the spread of decay. Each new injection treatment requires a new set of holes to be drilled. The larger the tree the more holes that are required, there may be from 4 to 14 holes required around a tree and over the space of 9, 12, 15 years this adds up to a lot of holes and damage and potential for decay. The primary defence mechanism for trees is the compartmentalisation of decay, or the shutting down of areas. The tree is effectively cutting off sections of themselves to try and contain the spread of disease. Every wound (drill hole) is a new section that must be cut off. Older trees are larger so they require more drill holes, also they are less successful at containing decay, particularly the movement up and down the trunk. See notes on tree biology and injection.